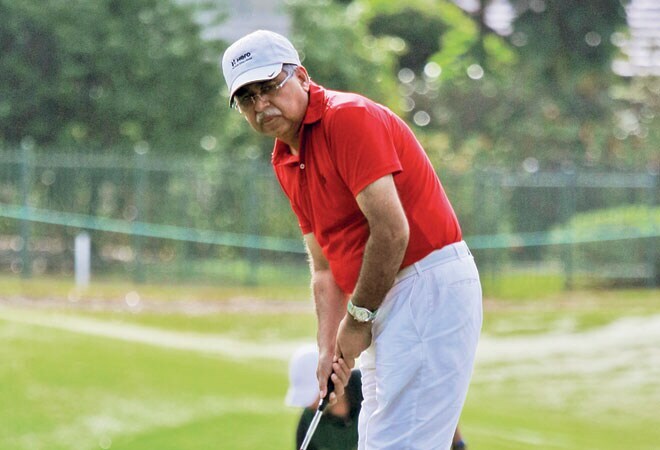 Pawan Munjal, Vice Chairman, Chief Executive Officer & Managing Director of Hero MotoCorp Ltd, announced the arrival of his company in the global arena with a bang by sponsoring Tiger Woods' annual invitational at Isleworth Golf & Country Club recently, in addition to appointing him as Hero's Global Corporate Partner for a period of four years. On a balmy Saturday afternoon, sitting at the Hero Sky Box at Isleworth, he shared his perspective on Hero's association with Tiger Woods and the event, his passion for golf as an avid amateur golfer, and promoting the game in India. The objective of the Hero World Challenge and the association with Tiger (as our global corporate partner) is not for the American market alone. It is a global branding objective. I think that Tiger represents everything from a person to an athlete and a global celebrity - I couldn't have gone for a bigger and better brand. But I've said this on earlier occasions too; he's not the first and the last (brand ambassador) for us at the global scale. We will definitely have more associations in the future. But it's too early to say what and how just yet. I started playing golf around 20 years ago, soon after I moved from Ludhiana to Delhi to put up the motorcycle project, Hero Honda Motors. A college friend of mine used to play golf. One day, he took me along to Siri Fort to hit some balls and practice. I have been a regular at the course since then. If you ask me, it is a very interesting and strategic game. It teaches you a lot. I am a fun golfer. When I go out to play golf with my friends, I feel at ease in the greenery, the environment and the fresh air. As one usually doesn't get an opportunity to get away from the dust and the grime in Delhi, I golf to soak in the calm. I do not do business on the course. I play for fun and do not hold a handicap. I play with Honma clubs. My driver and 3-wood are Cobra while my 7-wood is a Callaway. I have been playing with Honma clubs for a couple of years now. Scotland is good. I've never traveled to Ireland, but I'm told that it has some great golf courses. Back home, I think Srinagar has a beautiful golf course. To my mind, the fifth tee of Royal Springs GC offers a great view. It has everything you can imagine - meadows, lake, mountains and blooming flowers - and presents a great picture. We need public courses in India; it's something we don't have in the country right now. People don't find it easy to go out and start playing golf. It's a much younger game now. You find fiveyear-old children on golf courses being coached in the finer nuances of the game. More and more people have now started playing. Golf infrastructure is clearly the key. We need more players to take up pro-golf, go outside India, play on bigger tours. We've just had Arjun Atwal playing on the PGA Tour, and the other guy is Daniel Chopra, who is half-Indian. Though I played with Woods on multiple occasions, never did I ask him for a tip or enquire about the clubs he was playing with. I was just having a nice, relaxed round. I'm surprised how I managed to remain like that with Tiger (at Delhi GC) by my side and more than 5,000 people watching. Will he come down to india? I'm sure that during the course of our four-year association, Tiger will come to India not only to promote the game but also to pursue initiatives linked to the Tiger Woods Foundation. Let us see how the Hero Indian Open evolves.